You’re not looking at this in the right light… is a multi­media installation in response to Pillsbury House + Theatre‘s Winter 2014 production of Johnna Adams’ play Gidion’s Knot. Because Gidion’s Knot hinges on adult interpretations of children’s texts in a public primary school setting, You’re not looking at this in the right light… focuses on sending/receiving meaning – particularly between children and adults. You’re not looking at this in the right light… and Pillsbury House + Theatre are participants in the Audience (R)Evolution Program, funded by the Doris Duke Charitable Foundation, and administered by the Theatre Communications Group, the national organization for the professional not-for-profit American theatre. 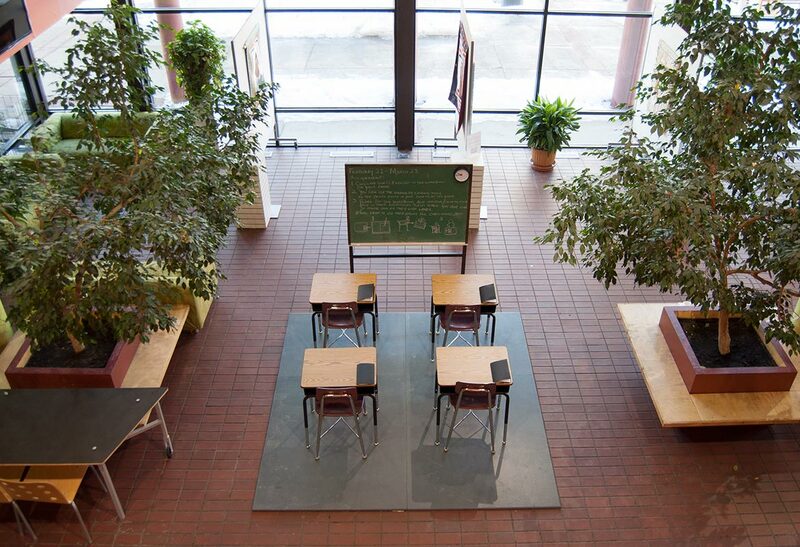 The center piece of You’re not looking at this in the right light… is the installation Understanding (A Classroom). 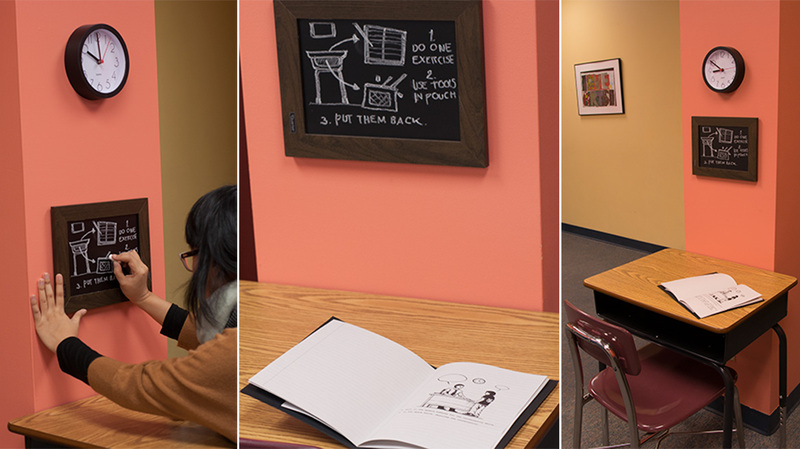 Four sets of classroom desks, chairs, workbooks, and writing tools line up in front of a replica of a wood-framed chalkboard. Placed as it is in the lobby (and ‘excerpted’ in the clinic waiting room on the third floor), Understanding (A Classroom) invites Pillsbury House + Theatre’s clients and patrons to recollect their own experiences in school, participate in the translation/interpretation exercises in Understanding (A Workbook), or simply take a load off! Looped on three displays in the first floor lobby, the video recorded performances in Misunderstanding II give voice to young people in FANS and CREW, two of Pillsbury House + Theatre’s after school programs. Like their fictional peers in the play, CREW and FANS kids are not always ‘heard’. But young people do speak up for one another; each video is a CREW member’s performance of a FANS teen’s experience of being misunderstood. The photographs in the installation Misunderstanding I were taken of FANS youth as they shared their own stories of miscommunication. These stories are the ‘origin’ of the performances in Misunderstanding II.